Oh snap! This pic is perfect for pinning! Now you too can help your friends that may be making these mistakes. Before we get into the list, I want to make sure you know that in the coming weeks I'll be addressing each mistake to help you overcome them! What's the point of pointing out mistakes if there's no solution for you? That'd be dumb. It'd be like saying, "well gosh, you have a rash. Good luck with figuring out how to get rid of it. BTW, it's hideous looking." Umm.. gee thanks. We are no longer friends. 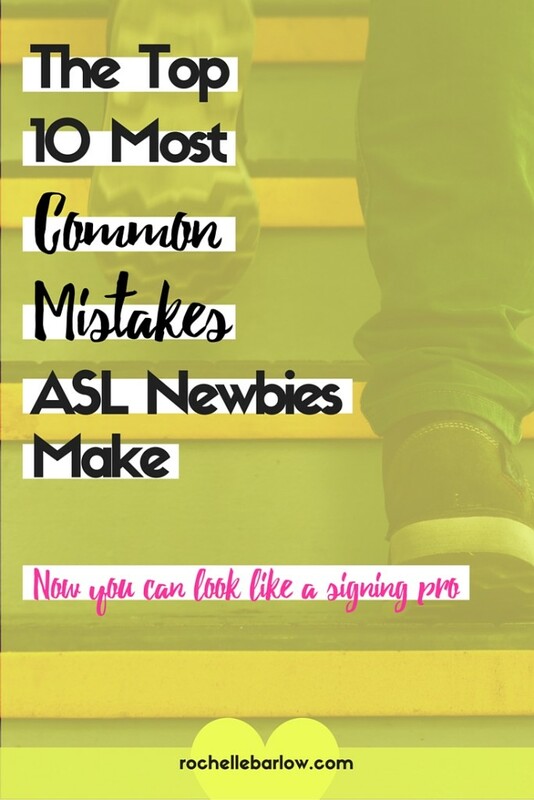 Okay, okay, NOW let's get to that list of the top 10 mistakes ASL newbies make! Your fingers are doing one of several things. Floppy: When you sign, your hands/arms/fingers are really loose. Meaning, they aren't forming the signs quite exact. It's like shaking someone's hand and they've got FISH hand. Ewwww. It's like that, but on your eyes. Plus, it makes it really easy to confuse your audience. Stiff: Are just awkward, not very expressive, and it's like talking to a robot. You can also be so stiff that your signs are hard to understand, or easy to misunderstand. Plus, no one really wants to converse with a stiff signer, it's just not pleasant. Just trust me. 1-- Learning your signs from a dictionary alone. It's easy to spot a "dictionary signer." That's a term I made up. At least, I think I made it up. You can spot them too. They don't quite understand the movement of the sign, they've got some idea of it, but it's either too big, the wrong direction, just not quite right, or placed incorrectly in space. 2-- Learning signs from other newbies or amateurs. 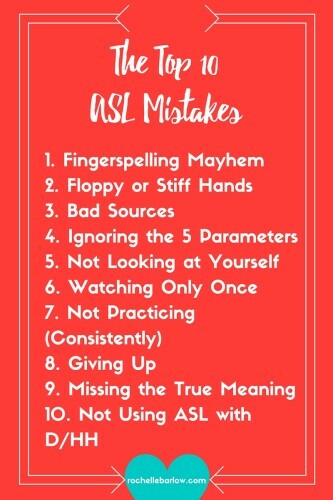 I cannot tell you how many times I have had newbie signers tell me they teach ASL. I just want to weep and then die. I think it's FANTASTIC they're learning ASL. I really do. I think it's great they want to share this great new thing they're learning with others and encourage them to also learn ASL. What I do not agree with is them labeling themselves as a teacher. Then, I find their innocent "student" in my course or in the practice group and have to help fix all the things they were mis-taught. Plus, it really does a disservice to the Deaf Community and causes a lot of unnecessary resentment from the DC to the hearing folks that teach ASL. Understandably. Rule of thumb: If the person has been learning ASL for under 2 years (active 2 FULL years of learning) they are not the person to teach you. The 5 parameters are involved in every sign you use. If one of them is off for a sign, then your sign is incorrect. What are the 5 parameters? Here's a really quick run-down. I promise I've got a whole video (already made) and a post coming soon to a neighborhood near you. You've got a lesson, a course, a class, whatever it is that you're learning from. You pull up that video and are so excited. You watch it, maybe you sign along with it, maybe you just sign it in your head. You check it off and move on to the next one. Did you practice it? Well, maybe when the video was running. After that? Notsomuch. Did you re-visit the lesson later on to refresh, double check, or practice? Nope. Now either one of two things happens. One, you're frustrated because you don't know any signs when it comes down to trying to communicate in ASL. Or two, you think you know all these signs and either wind up guessing at what you think the sign is, mis-remembering it, freak out once you realize that oh no- you don't know how to sign that after all, and then you blame someone else (me). This goes along with #6, but it needs to be repeated. You might be watching the lesson, practicing a bit for a day or two, or when you can remember to. You're just not practicing with any regularity. You're not using sign on a consistent basis. ASL is a language that I think is both quick to pick up and quick to lose. You can learn 20 signs all in one sitting, but you can also forget 30 over a week's time. You won't improve if you're not dedicating yourself to using signs and working on a specific skill at each practice session. You're overwhelmed, frustrated, confused, fearful, unsure and you just quit. It's easy to find a good reason to quit something that's hard. I see this especially in ASL students when they're trying to understand what someone else is signing to them. Receptive work is the hardest part of ASL. You can sign all day long, but understanding what someone else is signing to you can fry your brain in 1.08 seconds. It's not a comfortable feeling to watch someone sign and your eyes glaze over and your brain says peace out. It's even worse when they're standing right in front of you and you're supposed to come up with some kind of a response quick. No thanks, see ya!!! Giving up mentally is a sure way to never understand what they're signing to you. You're going along signing and then all of a sudden, you've signed something weird, mismatched, or just the wrong word. What's the problem? You're thinking in English and not ASL. First off, that's English word order. Second, there's unnecessary words in there. Third, you're not literally dying. Instead sign: I THIRSTY (with a ton of emphasis and emotion while signing thirsty). I would sign it really slowly and exaggerated along with some miserable and dying looking facial expressions to go along with it. Now they know I'm really thirsty. You could technically sign REAL or VERY in front of your THIRSTY. But that's not near as fun or as descriptive. Especially if you leave off the facial expressions and body language. This was just one small example. You are learning ASL to communicate with people that are Deaf and Hard of Hearing, right? I hope so. Bonus Mistake: I'm no newbie! Folks claiming proficiency when they're just starting to learn (or only have a year under their belt). They're the ones labeling themselves "not a newbie." Erg. There's nothing wrong with being a newbie. At all. Embrace it, take advantage of it. Enjoy it. Just because you're starting out and someone else is more experienced than you doesn't detract from your ability to sign or to learn to sign. There's a lady that I know that volunteered at an elementary school to interpret, claiming that she was proficient in ASL. The usual interpreters were out sick one day and they needed someone to fill in while they scoured the area for another interpreter. They asked this lady to step in since she said she was an excellent signer. Major fail. She didn't know a darn bit. Or not near enough to be able to even hold a conversation. She was signing things incorrectly, fingerspelling half of everything, and just plain embarrassing herself. The kids were confused and not learning anything. The worst part was, she thought she was a champion signer the entire time. The interpreter coordinator was extremely upset and actually pulled her from that classroom the next day and has never used her for ASL anything again. I'm pretty sure she's still walking around today thinking she's hot stuff. I've been signing for a long time. There are still things I want to learn, there are still skills I can improve upon. It doesn't take away from what I know. It just means that learning a language is a skill you nurture for life. Now you know the top 10 mistakes, be sure to watch that you aren't making them. I'll be sharing videos and posts that go into further detail on how to avoid making these mistakes and what to do instead. I'm all about knowing what to do and being able to take action. A great place to start is joining the ASL Practice Group. It's free and you'll have a blast doing the challenges, meeting other signers, and getting great feedback and practice time in. I've seen so many signers in the group improve like mad cow crazy.